What is Git? What is GitHub? Git is a free, open-source version control system designed to handle everything from small tasks to major projects. At its most basic, version control is a technical term for a system that manages your documents in a way that supports unlimited undo operations. Git lets you roll back to an earlier project state (thus undoing a cascade of changes). But what happens if you mess up a small section of a program you’re writing and then make changes you want to keep in a different section of the program? In that case, if you roll back to the state before you started making errors, you also lose subsequent changes that you want to keep. 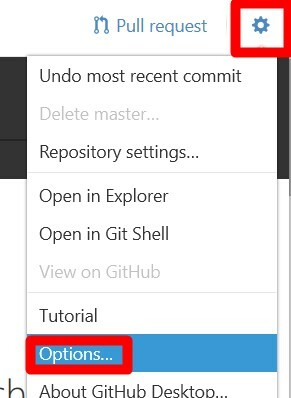 Git addresses this concern by allowing you to revert (undo) specific changes to parts of a file while retaining later modifications you may have made elsewhere in the same file. The graphical desktop client is available only for Windows and MacOS. Linux users should follow the instructions at this link for the command line interface (as should Windows and MacOS users who may prefer the command line). In addition to the newtFire git shell tutorial, there is a condensed guide to the most important command-line commands at https://training.github.com/kit/downloads/github-git-cheat-sheet.pdf. To access the three options of interaction from the desktop client, simply right click on the repository you wish to interact with and select the desired interface: View on GitHub , Open in Explorer , or Open in Git Shell . The images provided in this tutorial are from a Window's installation. The desktop client will look slightly different on a Mac installation. Create an account for yourself on GitHub, if you don’t already have one. Create a repository (repo.) for your project. Only one member of the project team needs to do this; in this course, that’s the project mentor. Repositories are usually created initially on the GitHub server (https://www.github.com) and then cloned (copied) to the local machine, but it is also possible to create them initially on your local machine and push them to GitHub. Other repositories can be created that are not course related. Add all project participants to the repo as collaborators. Add all of the course instructors, as well. Anyone can view your files, but only collaborators can create, change, or delete files in the project space. If you have created the repo on the GitHub server (which is the most common procedure), clone (copy) it to your local machine. If you have created it on your local machine, push (copy) it to the GitHub server. In either case, you will wind up with the repo on the GitHub server and the repo on your local machine. Create or edit files on your local machine. When you are satisfied with your work, commit your changes (mark them as ready for uploading) and then sync your local repo with the server. 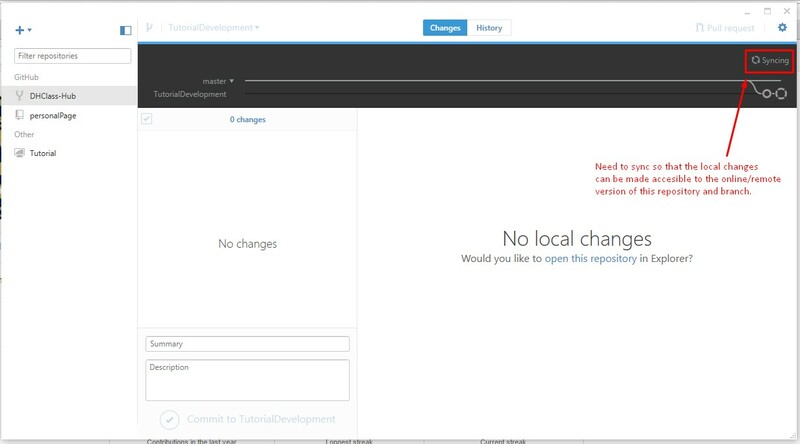 Syncing with the GUI client is bidirectional; when you sync a repo., you upload all new or changed files from your local machine to the GitHub server, and you also download to your local copy all changes that your project partners may have synced to the server. 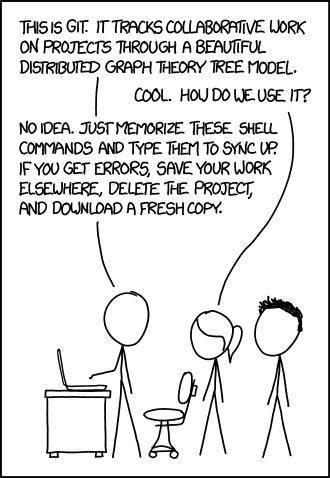 Mindful syncing practices are critically important in preventing merge conflicts between project participants; therefore, sync before beginning your work on your local machine and sync again after you have committed any edited files. There are other optional actions available through GitHub including creating a Branch and working in a Fork , which are described with greater detail below. It is most important when working with Git to follow our list of Best Practices. Because GitHub is a social networking site, where people post their code so that it will be accessible to others, using it requires creating an account. You can create a free account by navigating to https://www.github.com. You are not required to create an account using your pitt.edu address, although if you associate an educational email address with your account, GitHub will give you additional benefits. Click here to see our step by step walk through for creating an account. Next, you need to install GitHub Desktop. Choose your operating system (Windows or MacOS). If you use MacOS 10.6 (Snow Leopard): The MacOS client provided by GitHub requires MacOS 10.7 or later. If you use an earlier version of MacOS and are unable to upgrade, you can use an alternative Git client (such as Git-Tower or SmartGit) or the command line tools. From here you will need to link your Desktop Client to your GitHub Account. Projects on GitHub are stored in repos (short for repositories ), which you can think of as equivalent to folders or directories on your computer. Repos can contain plain files and subdirectories, so you can use the subdirectories to organize your project files according to whatever hierarchy makes sense to you. Initially you may want to put all of your project files into the main repo directory, and as you add additional files and your project becomes more complex, you can think about creating subdirectories and distributing the files among them according to file type or other criteria. Your project mentor will advise you about how to structure the directory space for your project. 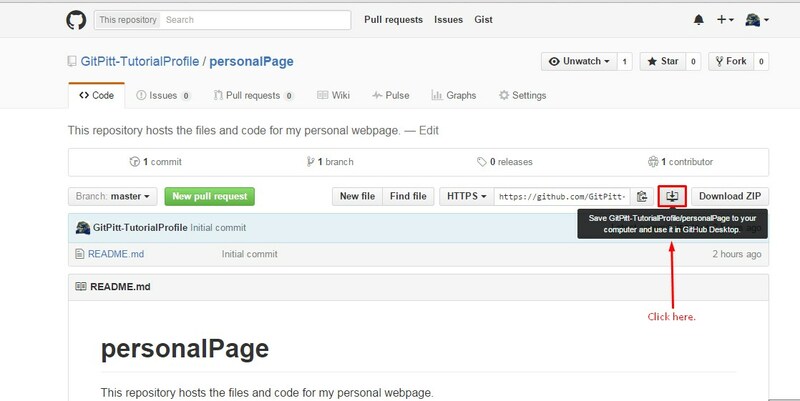 Your main project repo will reside on https://www.github.com, which is a public server that is accessible to others. 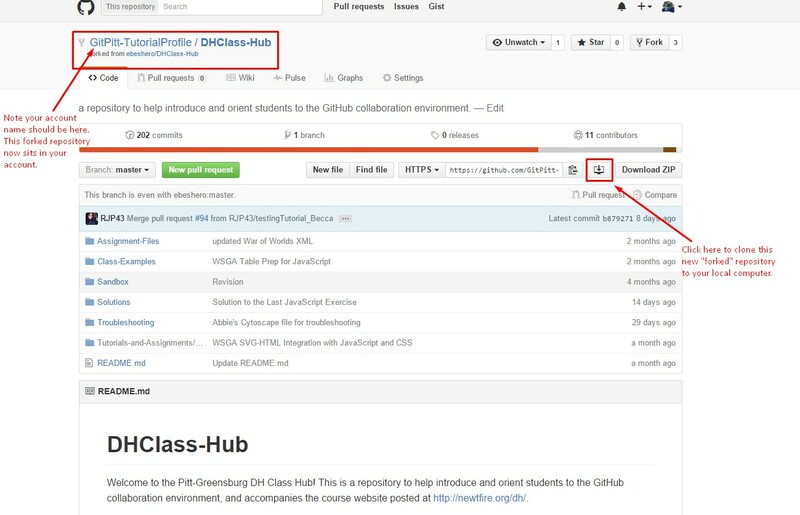 It is possible to edit files directly on the server, but the normal way to interact with GitHub, and the one that we will use in this course, is to work on copies of the project files on your own machine and then, when you are satisfied with the state of your work, to push (upload) your new or modified files to the server so that your project partners will have access to them. Similarly, when your project partners push their changes to the server, those won’t be reflected in the copies on your local machine until you pull (download) them. 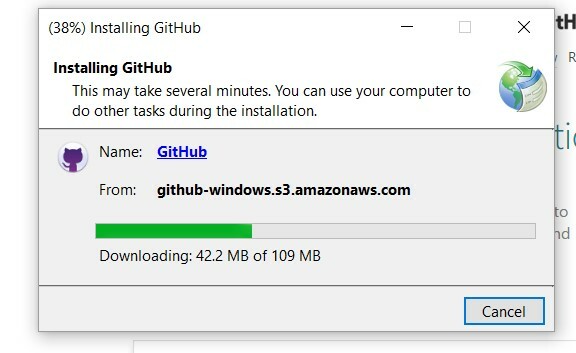 The process of uploading files you have modified from your local machine to the GitHub server, and of downloading from the GitHub server files that your project partners may have developed or modified and uploaded, is called syncing (short for synchronization). When you begin a work session, you should start by syncing your local project space with the server (see below), so that you’ll catch up on any changes other project contributors have made, and when you reach a stopping point in your work when you have new or updated files that your project partners need to see, you should commit (see below) and sync again. You don’t have to sync after every keystroke, but you should sync whenever you reach a reasonably stable intermediate point to which your project partners should have access. Students are used to thinking about work as something you do in private and submit or share only when you’re finished. 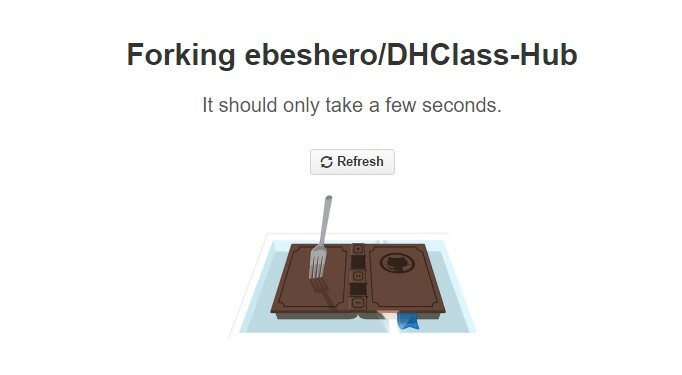 That isn’t the way software development on GitHub works. All project work should be conducted in your local repo and should be synced frequently with GitHub. Don’t get in the habit of working in private space with the idea that you’ll copy your work into your repo when it’s finished. And don’t put off pushing your new work. Project members should always have access to one another’s work, including at intermediary stages. 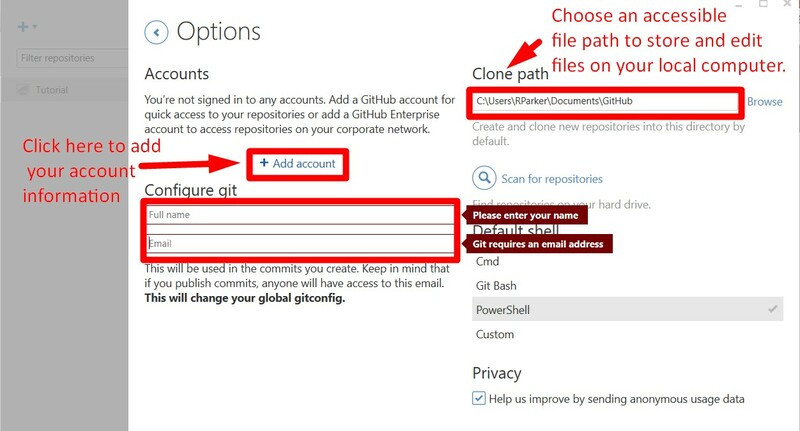 You can create the repo initially on the GitHub server and then clone it (see below) to your local machine. This is the procedure we usually use in our own work. 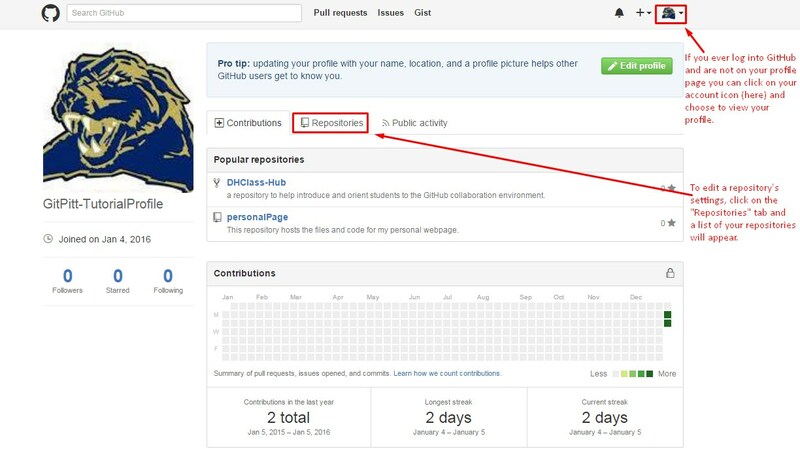 Log into the GitHub server at https://www.github.com and click on the Repositories tab in the center of your account profile's screen. 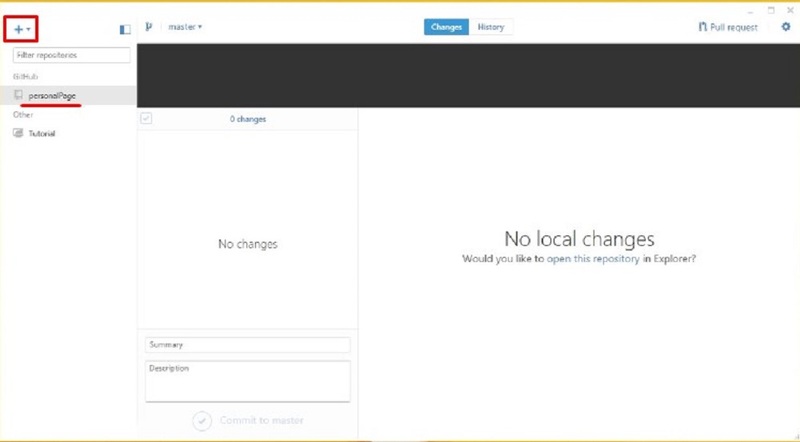 From there you will need to choose a name for the repository, add a description, and select public. If you are working on assignments outside of this class, you may want to take advantage of the free private repositories offered to students (more information below), but all repos for class projects must be public. Note that GitHub repos, like file names in our course, cannot have space characters in their names. If you try to enter a name with spaces, GitHub notifies you that it is not valid with a red X . 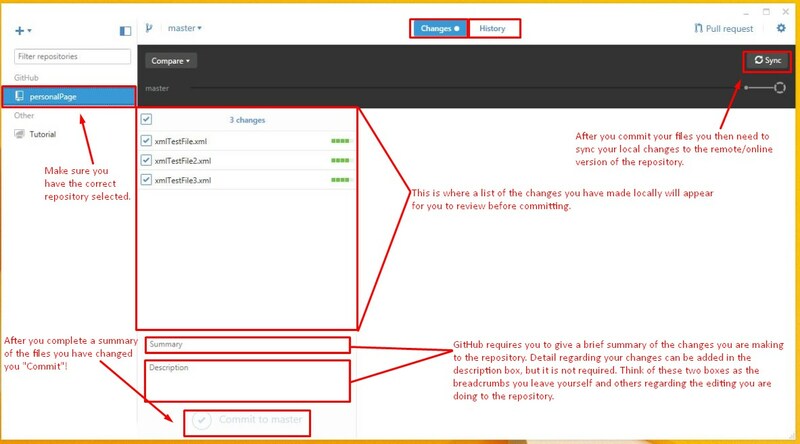 After selecting the Create repository button, you will be redirected to the server page for your repository. Your repository is ready for use. 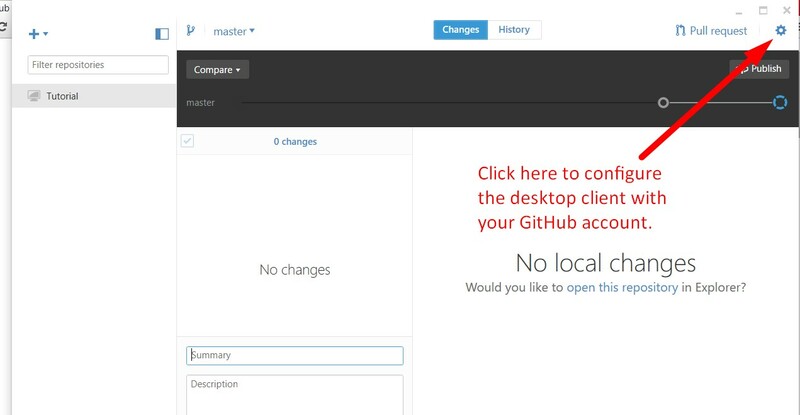 To create a repository through the GitHub desktop client, begin by opening the desktop client. If you have previously created a repository, you should see those on the left side of the client (for example: reference the red, underlined repo in the image below). Click on the + in the top left corner (boxed off with red in image below). From there, click on the Create tab. 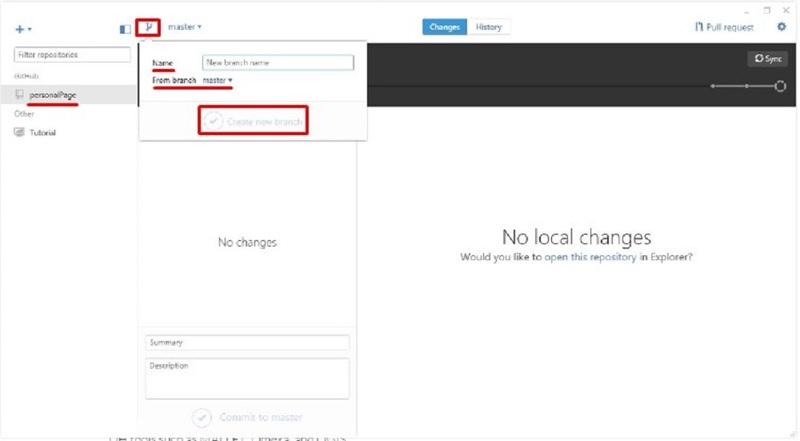 Fill in the desired name for the new repository, and Browse your local computer to assign a local path where your repository will be available. 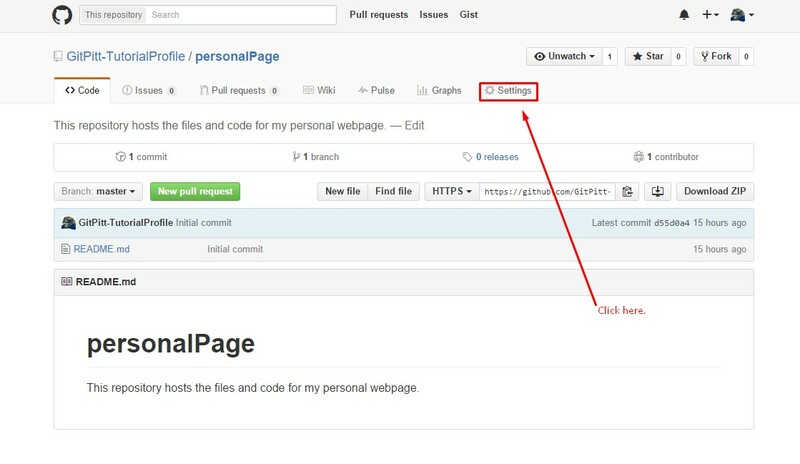 If you already have an existing folder on your computer that you are using for project development, instead of creating the repo initially on GitHub and cloning it to your local machine, you can configure your local folder as the repo and push it to GitHub. Navigate to the desktop client and click on the + sign in the top right corner. Select the Add tab, and Browse your local computer to select the a folder you wish to configure as a GitHub repository. 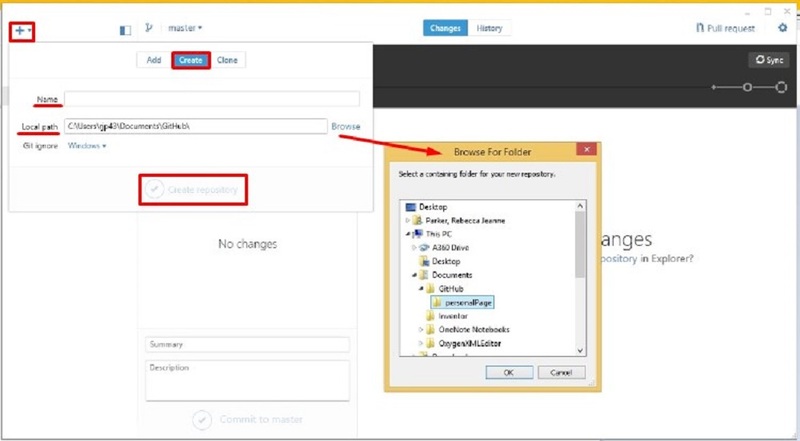 Another way to create a repository if you already have an existing folder on your computer is by the drag and drop technique. To do that you can drag the folder into the whitespace in the GitHub client under where your repos are listed, which will copy your local repo to GitHub automatically. When hovering a folder over your interface, the client will react. A pop-up displaying drop anywhere to add will appear. Note: this is only applicable for folders. 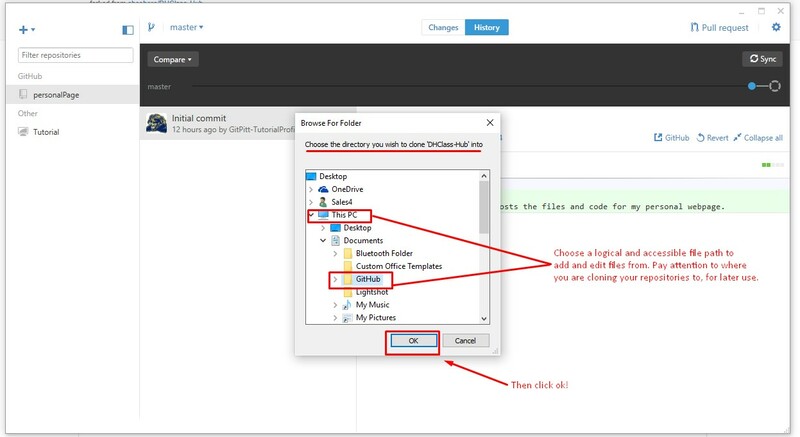 Individual files must be manually added to a repository. Sign in. Navigate to your profile. Type the user name of the collaborator you want to add. (This means that you’ll need to ask your collaborators to tell you their GitHub user names in advance.) As you type, a drop down list will be generated matching what you have typed. Select the user you would like to add from the list. Then click Add collaborator . As we explain above, the way you work on your project (create files, edit files, delete files) is to work on them on your local machine and then sync any modifications to the GitHub server, so that they will be accessible to your project partners. 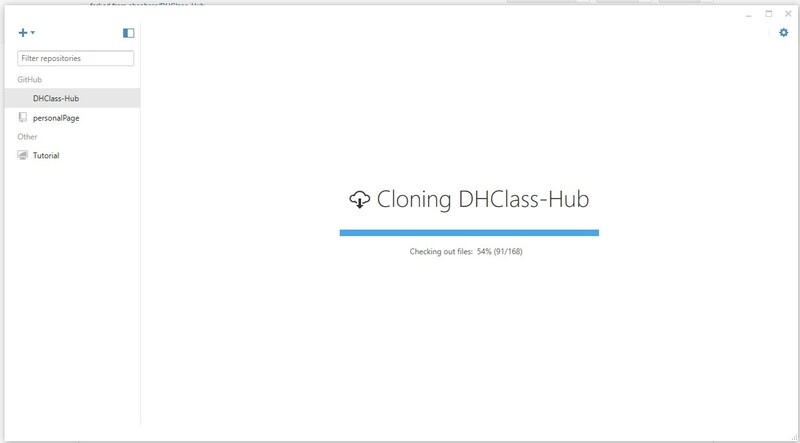 The technical term for copying a project from the GitHub server to your local machine initially so that you can begin to work on it there is called cloning. You only have to clone a project once, when you first begin to work on it (that is, cloning is copying a new project to your local computer so that you can begin to work on it; whereas, syncing is exchanging updates between your local computer and the GitHub server after you’ve already cloned the repo and established a local copy in which you can work). This working model separates saving your work to your local computer (which you should do very frequently) and syncing your local clone of the repo with the master copy on the GitHub server, a design that protects you from uploading mistakes to the server. That is, you do your development on your local machine, where only you have access to the files, and when you’re ready to share your work with your project partners, you sync (upload) it explicitly to the server. If you created the repo initially on your local machine and pushed it to the server (see the description above about how to create a repo. ), you don’t have to clone it because it already exists on both the server and your local machine. If, though, you created the repo initially on the server, as we usually do, you need to clone it, and the same is true if you aren’t the person who created it—for example, if your project partner created the repo and added you as a collaborator. This will launch the Desktop Client where you will need to save the cloned repository to your local machine. Save the cloned repository to your local machine. When saving the cloned repository to your local machine the default on Windows is usually under a GitHub folder located inside your My Documents folder; on a Mac it is usually directly under your home directory. You do need to be able to find your way to your local cloned copies because that’s where you’ll do your editing, so once you’ve cloned your first repository, open the Windows Explorer or the MacOS Finder and look for the new local repo. If you can’t find it, ask one of the instructors for help. When you want to change a file, edit your local copy. You can do this by accessing the file on your local machine, like you would any file stored normally on your computer. Make whatever changes you would like. When you are satisfied with the changes and ready to share them with your project partners, open the GitHub client. 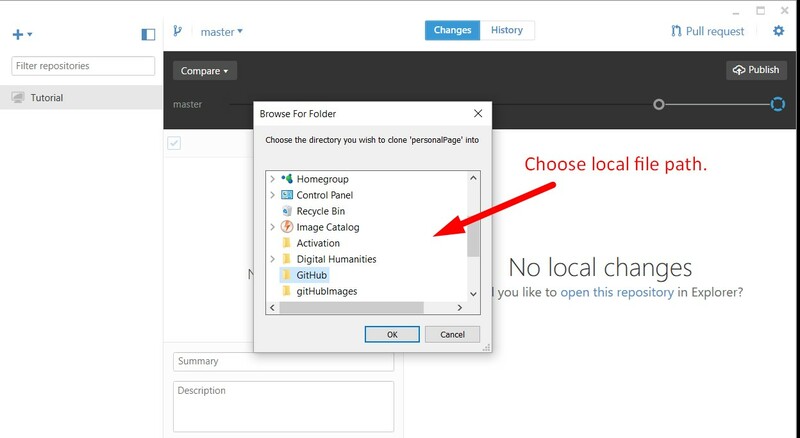 Navigate to the local repository in which the file exists and open it. Any files that were edited/added will be listed on the right under the Changes tab, and previous commits to the repo are listed under the History tab found at the top of the Desktop Client. You must provide information about the uncommitted changes. You should enter a short summary to remind yourself of what’s being changed (this part is required), with a more extensive explanation in the description field (optional, but useful if the short description isn’t fully adequate). Then choose commit to … (yours will probably say commit to master . The changes will be pushed to the GitHub server the next time you sync the repo., but until that happens, the committing applies only to your local clone of the repo., and the server doesn’t know that you’ve changed anything. To push your changes onto the server so that they will be accessible to your project partners, you must sync the repo (which, in addition to pushing any committed changes from your local clone to the copy on the server, also pulls down from the server any changes your project partners may have pushed since the last time you synced). Once you have committed and synced, the commit will now show up under the History tab. Click to sync for the most recent versions of the repository. If you commit and push something that you later decide was a mistake, you can revert or roll back the commit. Rolling back the commit undoes the changes and all later. Reverting the commit reverts the changes made in the specific commit, but it doesn’t affect other, later changes. The ability to undo an error without having to undo all of the non-erroneous changes you made afterwards is a powerful feature that distinguishes the Git way of doing things from the undo feature in word processors and other applications with which you may be familiar. The master branch is the main branch of a project, and because for most of our own projects we do all of our work in the master branch, you may decide to skip this part and not worry about creating additional branches. In complex projects, though, it may be important that the master branch not have errors, and always be in good working order. If everyone is writing new code into the master branch, it’s possible for the master branch to enter an unstable state temporarily. To avoid that, complex projects may require that all developers work on different parts of the project separately, in their own branches, and merge their individual development branches into the master branch only once they are confident that it won’t have a destabilizing effect. This can be useful even in single-developer projects if you need to maintain multiple versions, such as a stable branch that people should be able to download and use and a development branch that will eventually become the new stable branch, but that isn’t yet stable. Branches can be merged and deleted because a branch is an inalienable part of the repo in which it is created in; thus, working in a branch requires you to already have a cloned repo. Just to be clear, when you clone a repo that has existing branches the entire repo gets cloned branches and all. To create a new branch using the desktop client, select the branches button in the top left corner to the right of the branch currently selected (labeled master in the image below because that’s the branch currently being displayed—and the only one in the project initially). More detailed images on working in branches can be found in the following section where forking is discussed. Part of the open-source etiquette is that developers are encouraged to copy and then improve code originally created by others. GitHub supports the creation of derived projects through forking. When you fork a repo, you create a copy of it under your own account, where it acquires an independent identity. You can do anything with a repo you created by forking someone else’s project that you can with a repo you created from scratch, but from the moment that you create the fork, your new repo is no longer synchronized with changes in the repo from which you copied it originally. If you fork a repo and make changes that you would then like to contribute to the original source, you can issue a pull request, inviting the developers of the original repo to merge your changes into their original project. 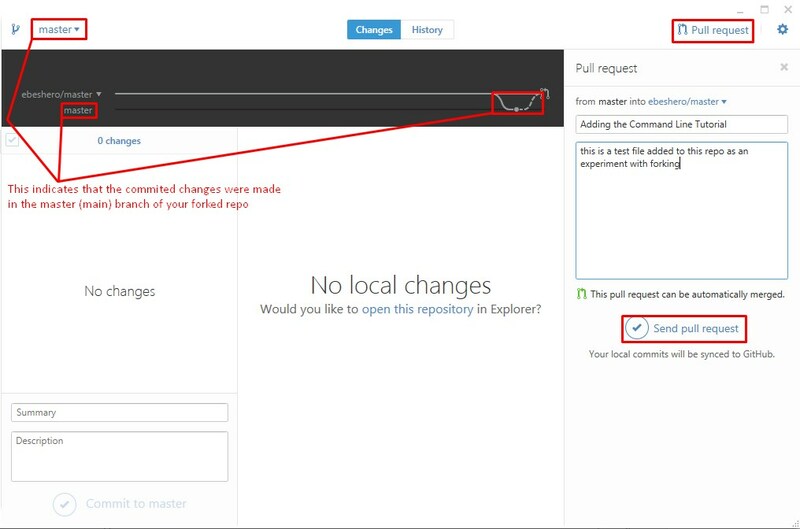 To fork a repository, first, navigate to the desired repo on the web interface. Then, in the top right click on the Fork button. The web browser will now redirect you to your web version of the fork . From this screen, you should then Clone your Fork to your local machine. 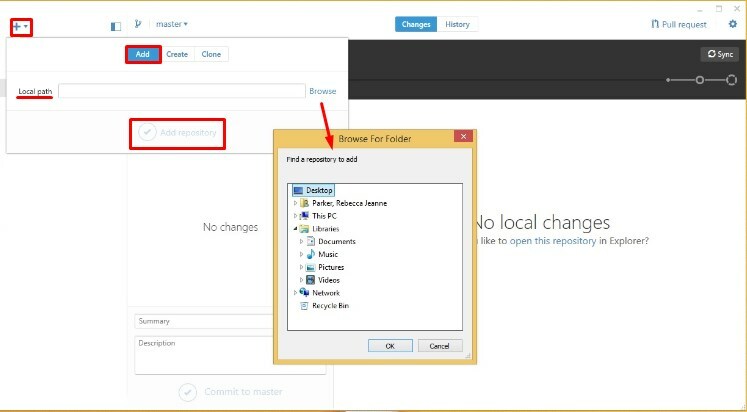 The desktop client will ask you to determine a local file path for your new repo. At this point, before doing any work, you might consider creating a branch. 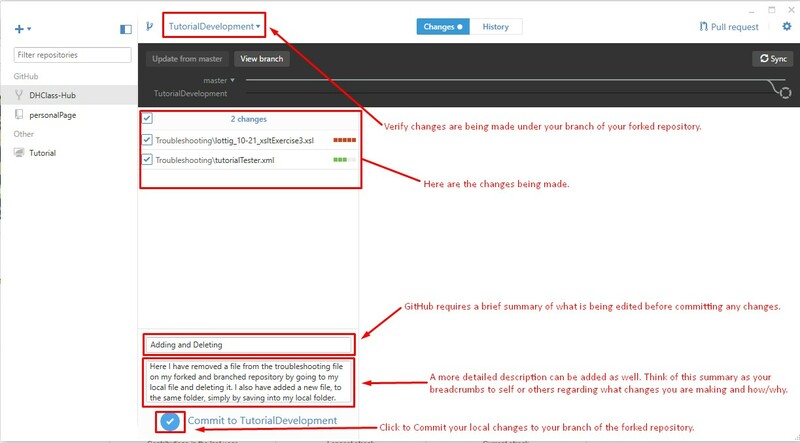 Once you have created the branch you will need to publish it to the GitHub server. In order to commit files under the correct branch before committing select the correct branch you wish to commit under. Once you have verified the branch you are committing in, you follow the same committing actions as described above. It is important to note that creating a branch in a fork will be very similar to creating a branch in a regular repo, because a forked repo acts as your own repo from the moment it is forked. See the image below for further explanation on creating a branch. Always remember to sync ! Syncing at this point pushes your branch changes to the fork . If you wish to contribute your changes to the original repo you could navigate to the original repos web interface and do a pull request or select the pull request button in the right corner of the desktop client. From there, it is up to the contributors of that original repo to pull your changes into their repository. This series of commands will need to be done every time you wish to bring new commits of the original repo (remote origin) into your local fork. In a nutshell, these commands define an upstream variable for the original repo, fetch the changes from there by placing them in a new branch called upstream/master , merges that new (temporary) branch into your fork, pushes these newly merged changes to the GitHub server of your forked repo, and then deletes the upstream/master branch from your fork. There is a way to do the final few steps, after git fetch upstream -v, in the desktop client; however, it becomes complicated navigating between the correct branches and syncing appropriately. Feel free to experiment with the understanding that the desktop client first four commands, from above, in order to configure the source of the upstream/master branch. Edit the local file that caused the conflict, following the instructions that Git inserted into the file. Then commit it and try again to sync. Revert the specific changes you want to undo, which will leave other subsequent changes elsewhere in the project unaffected. Roll back to a stage of the repo before the conflicting edits were synced, although because rolling back will undo all changes since the roll-back point, including some you might want to keep, it should be a last resort. 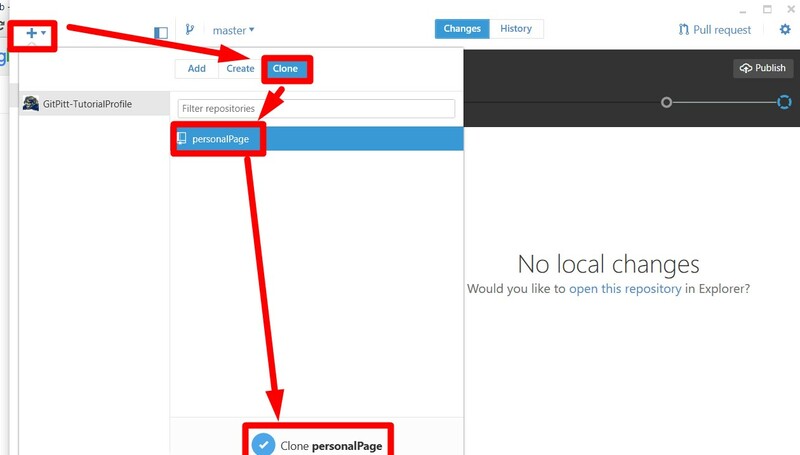 You can delete your local clone of the repo and clone it again from the GitHub server. This throws away all of your local changes that you haven’t yet pushed to GitHub, which means that it may be useful if you’ve messed up your local files and don’t have anything new there that you want to save, but not if you’ve also created new content that you don’t want to lose. Sync at the beginning and end of every work session. Since you last worked on your project, your project partners may have pushed changes to GitHub. Starting every session by syncing your local repo with GitHub is the most important thing you can do to reduce the likelihood of edit conflicts later. Do all of your development work in your local GitHub repository. You should never edit outside your local repo and plan to copy your work into the repo when it’s ready. Commit your changes frequently. Committed changes are only on your local machine until you sync with GitHub, and you can always revert (undo) them. If you do a lot of work on independent bits of your project and plan to commit them all at the end, it will be difficult to treat them separately later. If you commit each one on its own, you can then address them individually and, for example, revert one that you later decide was a mistake with less risk of affecting other parts of your project. In addition to always syncing your local repo with GitHub whenever you begin a work session, you should sync whenever you reach a reasonable stopping point. This is a courtesy to your partners; when they start working and begin their session by syncing, they’ll get the most recent version of your work. 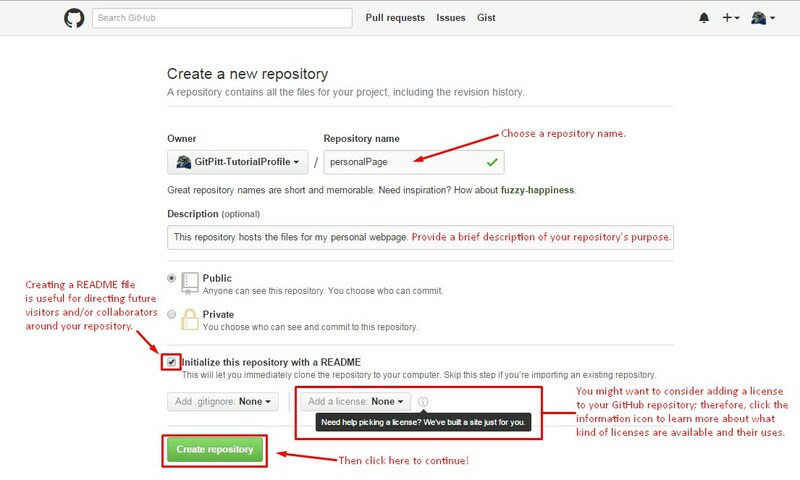 Git and GitHub can be a bit confusing for new users, but it makes project management much more robust than the available alternatives, it’s what we use in our own work (you can visit our projects on GitHub), and learning to use it is worth the effort. This tutorial is designed to get you started, and your instructors are available to advise and help if you get stuck or confused. There are a number of resources online to further your knowledge, but they all go into more detail than you need just to get started. If you decide to read more, note that there are terminology differences between using the shell and the client. To understand the shell, you can consult the Pro Git book, which is available on line at no cost. There is also a helpful, interactive tutorial on using the Git command-line interface available at http://try.github.io/levels/1/challenges/1. GitHub is free for use with respect to public repositories, and your course project resources must be kept in a public repository. 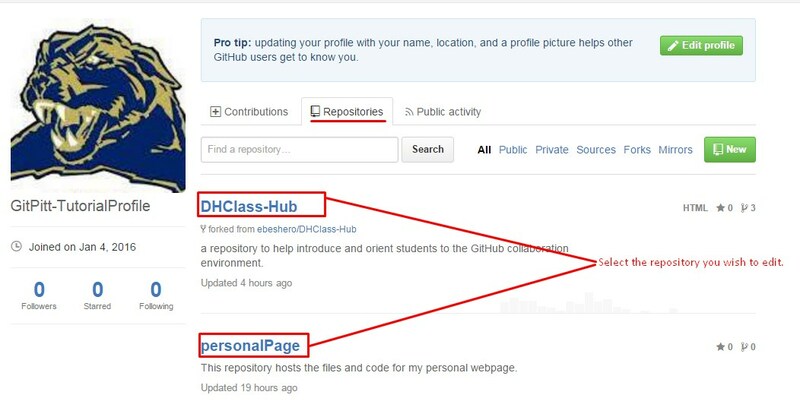 Should you wish to use GitHub for other projects, though, if you are a student and you configured your GitHub account with a .edu email address, you are allowed to set up five free private repositories (if you registered initially under a different email address, you can change that in the account settings online). Go to https://www.github.com/edu, choose the I’m a student link, fill out a brief form, and then enjoy your private repos!